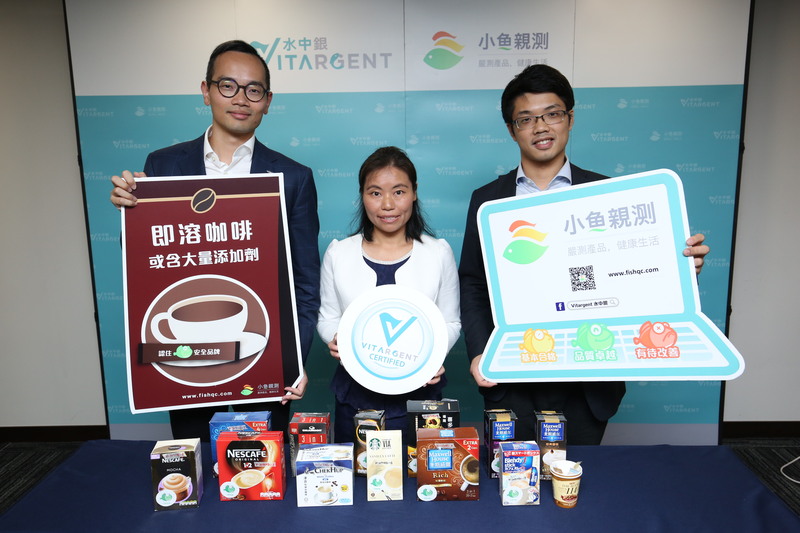 (Hong Kong, 13 July 2017) Vitargent (International) Biotechnology Limited (“Vitargent”) extends its reach to coffee products and publishes test results of instant coffee products available in the market on its Test-it™ information platform (www.fishqc.com). Known for its safety examination of cooking oil and BB cream, Vitargent has applied the “transgenic medaka” and “zebrafish” embryo toxicity testing technology, which is unique in the world and developed by Hong Kong scientists, on instant coffee samples. The test rated 13 out of 30 samples as Green Fish (excellent), seven samples as Yellow Fish (basic) and ten samples as Red Fish (sub-optimal). In terms of overall safety, instant coffee brands from Southeast Asia underperformed their European and American counterparts. In particular, cappuccino is the lease safe type of coffee to drink as more than half of the samples failed the safety test. Furthermore, the test also suggested that the toxicity of instant coffee was 1.8 times of the level of chain coffee. Nonetheless, as coffee comprises only 5-9% of the total contents of certain samples tested, the toxicity of instant coffee is presumed to be from the additives such as stabilizers, emulsifiers, anticaking agents and flavouring agents that make up the rest of the products. Consumers are recommended to choose brands that are rated Green Fish when purchasing instant coffee. Drinking coffee has become a global phenomenon in recent years. Not only does it set new trends in catering, it also becomes a status symbol. As instant coffee costs less that chain coffee, introduces new flavour constantly and is easy to brew, many caffeine heads love to make coffee by themselves at work and at home. However, consumers may overlook the additives in instant coffee products which pose health risks when consumed excessively. In view of this, Vitargent purchased 30 best-selling instant coffee products from supermarkets and online shopping platforms, namely Jingdong and Tmall, for fish embryos toxicity tests in May 2017. Samples tested include products from 11 famous brands such as Starbucks, Nestle and Maxwell. Unlike conventional chemical testing methods, Vitargent’s biological testing technology enables screening of “cocktail effect” caused by mixing over 1,000 toxicants and chemicals within 48 hours. The technology also covers chemicals that are not included in the routine test. Given that zebrafish has analogues of 84% of genes that associate with human diseases and substances that are toxic to zebrafish embryos are likely to be toxic to human, they are used in the test on acute toxicants in instant coffee. The test result of Test-it™ rated 13 out of 30 instant coffee samples as Green Fish (Excellent), seven as Yellow Fish (Basic) and ten as Red Fish (Sub-Optimal). The average price of the 30 samples purchased is 4 HKD/packet. The most expensive sample costs 11.4 HKD/packet, which is 11 times of the cheapest one which costs 1 HKD/packet. For samples that cost more than 3.8 HKD/packet, each of the Green Fish, Yellow Fish and Red Fish takes up more or less the same proportion, with four of the samples (33%) respectively. All in all, high-priced samples are hit-and-miss and pricy products are not necessarily safer. On the contrary, mid-priced samples performed better in the test. In terms of brand origins, European and American brands (from United Kingdom and Germany) outperformed Southeast Asian brands (from Vietnam, Malaysia and Thailand). Each of Green Fish, Yellow Fish and Red Fish takes up three (30%), four (40%) and three (30%) of samples from Southeast Asian brands respectively. For European and American products, each of Green Fish, Yellow Fish and Red Fish accounts for four (67%), two (33%) and zero (0%). The test of East Asian brands (from China, Japan and Korea) shows mixed results, with six rated Green Fish (43%), one rated Yellow Fish (7%) and seven rated Red Fish (50%). Mr. Jimmy Tao pointed out that, additives are crucial to the food industry as they not only improve stability of products, but also enhance the colour, smell and taste and extend shelf life. Nonetheless, certain chemical compounds may pose potential health risks. Non-dairy creamer, which is primarily made up of hydrogenated vegetable oil, glucose syrup and casein, often ranks top on the composition labels of instant coffee products. This ingredient boosts solubility of coffee and gives its milky texture in water, but does not necessarily contain milk. As most non-dairy creamer contains hydrogenated fats and trans fats, excessive consumption can increase the level of low-density lipoprotein cholesterol in the body and in turn, the risks of cardiovascular diseases. Recent scientific studies also proved that trans fats are associated with Alzheimer’s disease, infertility, breast cancer and prostate cancer. The nutrient composition of instant coffee, especially the intake of fat, calorie and sugar, is worth paying attention too, as sugar is one of the main ingredients. The nutrition labels of some samples tested suggest a packet of the products contains 19g of sugar, when considering taking three meals a day, such products exceed the sugar intake limit recommended by WHO, which is no more than 50g or about ten teaspoons a day. Moreover, among the 14 samples that explicitly specify sugar content, a packet of the products contains 0.6g to 19g of sugar. Based on the instructions on the product packages, eight samples were found to contain 6g to 10g of sugar per 100ml and therefore go pass the guidelines of the Centre for Food Safety on sugar content, which recommend not more than 5g per 100ml. As revealed by the article titled “The toxic truth about sugar” published on the science magazine Nature in 2012, sugar is an addictive substance and excessive consumption can lead to obesity, diabetes, heart diseases, liver diseases and other illnesses. Howe et al. The zebrafish reference genome sequence and its relationship to the human genome. Nature. 498-503; doi:10.1038/nature12111. GB 2760-2014. Food Safety Standards: Food Additives Standards. 21 CFR 101.4(a). Code of Federal Regulations： Food; designation of ingredients. Regulation (EU) No 1169/2011 of the European Parliament and of the of 25 October 2011。 Official J Eur Union. L 304/18. 22.11.2011. Vega-Lopez et al. Altherosclerosis. 2009, 207(1): 208-212. Grimm et al. J Nutr Biochem. 23(10):1214-1223. Chavarro et al., Hum Reprod. 2014, 29(3): 429-440. Makarem et al. Annu Rev Nutr. 2013, 33:319-348. Allott et al. Prostate Cancer Prostatic Dis. 2017, 20(1): 48-54.
 WHO Healthy diet. Fact sheet No394. Updated September 2015. Food and Drugs (Composition and Labelling) Regulations (Cap. 132W). Lustig et al. Nature. 2012, 27-29. Doi:10.1038/482027a.